A woman died after being shot 12 times Wednesday morning in Logan Square, according to police. LOGAN SQUARE — Neighbors said they're "traumatized" after a young woman was shot to death on their block Wednesday morning. About 10:30 a.m. Wednesday, police said the woman, whose age is unknown, died after being shot multiple times near Spaulding Avenue and Cortland Street. A man got out of a car, described as black Dodge Charger with tinted windows, ran after her and fired "multiple shots," striking her a dozen times, police said. One mother, who spoke on the condition of anonymity, said she was in her living room with her children when she heard multiple shots fired, and she immediately threw the kids on the ground. "I looked out the window and saw a black car parked with keys in the ignition," said the woman. She said the gunman continued shooting as he ran back to his car and fled eastbound. "It's crazy. I'm still traumatized now," the witness said. After the shooter left, another neighbor said, others gathered around the victim, who lay next to a dumpster outside a home being rehabbed. "No one wanted to touch her [because] she had a lot of bullet [wounds]. I moved her hair out of her face and tried to speak to her. I could see she was breathing really shallow because her back was moving. Her eyes were open [then], rolled back a little," said the second woman, who declined to give her name. The victim was taken to Stroger Hospital, where she was pronounced dead. 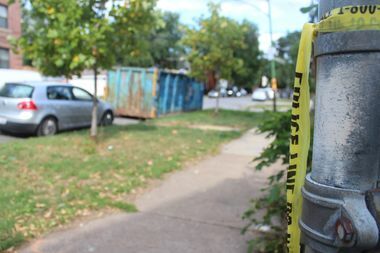 Hours after the shooting, police tape lay atop a pile of trash in the dumpster, while other sections of the tape remained in an alley where children played basketball. The second woman, who has lived on the block for a decade, said shootings were a lot more frequent when she first moved in, but had decreased until recently. Parents had grown accustomed to letting the kids play outside, she said. "It's a shame we got to keep them inside now," she said. Police said the shooter was wearing a red T-shirt and is about 20 years old. The History of 'Dibs': Did It Begin in Chicago?